I was going to title this post “The Day I Ate a Whole Chicken On The Side of a Mexican Highway” and then I realised that whilst this was no doubt a seminal moment in my life and journey, it’s not a tale my followers would cherish, and perhaps I should ask a guest blogger to post. I’m short on stories – it’s not Mexico’s fault, it’s mine. I’m racing through the cunningly disguised Goliath of a country (one in which I will ride further than in the whole of the continental US, unbelievably) and I’ve crunched more miles this month than in any of the preceding thirty eight. Roast chicken helps. Dear Mr Fabes, I am offering some content for your health / sport / travel blog. I make home made placenta cakes from genuine human placenta and would like to share the recipe with your online audience. I charge 1000 US dollars, please deposit into my Nigerian bank account before you publish my award winning blog entry. Bloggers who unwittingly obey all my rules for writing a GREAT travel blog are not welcome here. So I will headhunt my guest bloggers, and the most affecting, inspiring and mirth inducing collection of yarns I have read of late is I Run Things – the fact that the author is a good friend of mine is beside the point. He fulfils that seemingly simple yet rare ideal – he has a story worth telling and he tells it well. It’s about… well, I’ll let Olly Davy explain. I sit by the edge of the water under a low September sun, squinting into the reflected rays at the swan gliding past between the marker buoys. I reach behind my back to undo my wetsuit and release the tightness of the second skin. Slowly, my breathing returns to normal as my body recovers from the sprint at the end of a 4,000 metre swim. I feel the blood pumping through my veins and the familiar sense of calm descending on my mind. Looking down beyond my dangling feet into the murky pond I see the face of my mother smiling up at me, and my eyes fill with tears. One year earlier, in August 2011, I was standing at the baggage carousel in Gatwick airport. Fresh from a road trip around the lakes of southern France, I was suntanned and content. The simple pleasures of driving through the mountains, eating great food and camping in the beauty of nature had made for a memorable holiday. My phone rang. 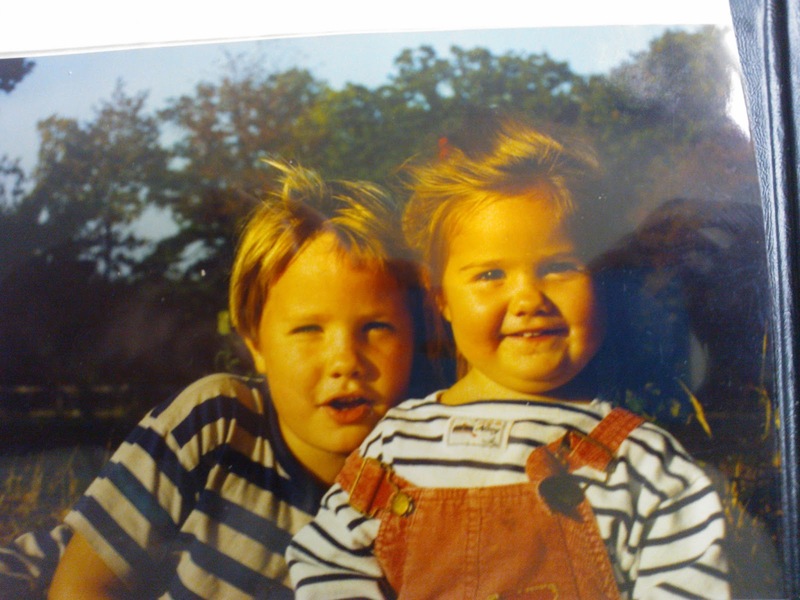 It was my sister and I answered in a cheery tone, glad at the chance to share tales of our happy trip. Some weeks after the initial shock of that announcement, cancer had become part of our everyday lives. My mother fought bravely against the disease and endured wave after wave of chemotherapy and radiotherapy. In the end, the cancer was too advanced and too strong and there was nothing anyone could do. The final reality was clear on the day, in June 2012, when the doctor advised her that now would be a good time to move into the hospice. Everybody knows that hospice is just another word for death. After only a week under the amazing care of the Marie Curie nurses my mother succumbed to the disease and my sister and I held her hand as she died. She was just one of the one hundred people who die each day from lung cancer in the UK. And even better during an Olympics year. Throughout that memorable month of Great Britain’s glory I was happy in the knowledge that once I got home from a run, a swim or a cycle, I could watch some real life superheroes take on the world and win in my own back yard. London 2012 was a non-stop drama of sporting prowess and my hometown was the stage on which it unfolded. I was able to find everything I needed to train successfully for the triathlon within cycling distance of my flat in East London. 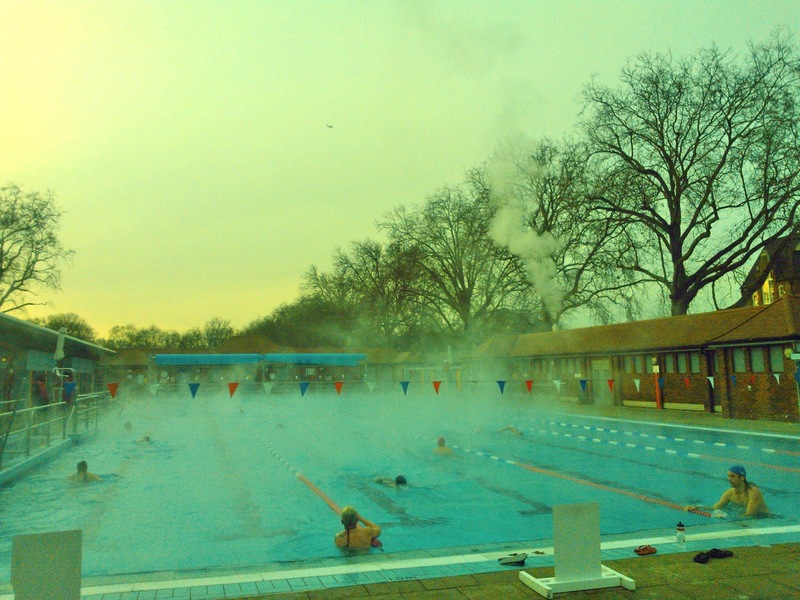 Three times a week I swam at London Field’s Lido. This facility possesses all the qualities a great swimming pool should. It is outdoor, heated, Olympic size and glorious. In the entrance hall they posted the winning times of the Olympic athletes on a big board, encouraging users of the pool to put their own times too. For longer sessions, and to acclimatise to conditions closer to that of open water, I went to Hampstead Ponds. The pleasure of swimming through natural waters among the ducks and geese more than made up for becoming an embarrassed spectator on the sidelines of North London’s gay cruising scene. To run without fear of being squashed by a truck I headed to Regents Canal where I could fly along by the water all the way to Limehouse Basin and beyond. And when it was time to clip on my helmet and saddle up, I would ride around and around the outer ring of Regents Park, where I learnt the finer points of peleton etiquette from helpful strangers wearing Team GB jerseys. Or, at other times, I watched the deer grazing as I cycled laps of Richmond Park under a setting sun. And, If I felt the need to do some hill training to build the strength in my legs then I would ride up and down the Muswell Hill, and Swain’s Lane in Highgate. Never have I found London more relevant and useful than while I trained for a triathlon during the Olympics. To prepare for the triathlon I followed a strict regime, training seven times a week for three months. My life was governed by the training diary blue-tacked to my wall and I did little else except go to work and train. A disciplined lifestyle was perfect for me at the time as it gave me the distraction I needed and kept me away from more unhealthy ways of dealing with grief. The training was a useful distraction from my emotions but I tried not to bottle anything up. Thankfully, the physical training helped me to understand and express what I was feeling better than I would have been able to otherwise. The clear-headedness that a long run afforded allowed me to simply be with my grief. Not to fight it or hide from it, but to accept it and allow it to pass over me, like a wave. As a man, and an English one at that, I am embarrassed by public displays of emotion and so to avoid collapsing into a snot-bubbling mess at the supermarket checkout I chose private times when I could cry alone. I scheduled my grief like a training run. But despite my attempts to stay in control, there is no way to know if you will suddenly burst into tears while speeding down a hill at thirty miles per hour. And that can be dangerous. It well known by anyone who enjoys exercise that it makes you feel good. It can put the icing on the cake of an excellent day or take the edge off a crappy one. When we exercise the body recognises this as a time of stress. It thinks we are either fighting an enemy or fleeing from one and so releases endorphins to minimise discomfort, block feelings of pain and even bring on a sense of euphoria. Humans have been managing their stress levels in this way for as long as they have faced challenges. There is even a Latin motto that sums it up nicely: solvitur ambulando, which means, “It is solved by walking”. Fascinated by the mood lift I experience after exercising, I began to look further into the relationship between the body and the mind and the effects they have on each other and articles discussing Descartes and dualism soon baffled me. I had opened a huge can of worms called the mind-body problem, but the basic fact remains; when I feel bad, I exercise, and although my circumstances will not have changed I am better able to cope with them. Discovering a new world of triathlon training tips and equipment reviews filled me with a nerdy joy. But I soon learnt that people would begin crossing the road to avoid me if I did not at least try to maintain an air of normality in polite society. You will be amazed to learn that not everybody cares whether the wetsuit you are considering buying will ensure the optimum equilibrium for your swimming position. Or if the cells of foam positioned on the upper forearm sleeve area – to encourage a better arm position in the catch phase of the stroke, will offer increased power and reduced fatigue. Disappointing reactions are best minimised by sharing our pastimes only with fellow enthusiasts. Be sure to make guarded references to your extracurricular pursuit until you are sure that you are in safe company. The London Triathlon was my goal but it was the experiences I had along the way that made the journey so worthwhile. I took every opportunity to train in unusual places. I ran on the Black Mountains in Wales, along the beaches of Sharm El Sheikh and North Norfolk, and took icy dips in the River Wye and the North Sea. I took up yoga to undo the tightness in my overworked muscles and spent wonderful Saturday mornings surrounded by beautiful women, stretching my body and soothing my mind. The journey was not only physical but mental and spiritual as well. That may sound a little dramatic but the triathlon came at a significant period in my life and as I looked for an answer to the ultimate question, ‘Life, what does it all mean?’ I found myself in a group meditation workshop that took place over twelve nights in a living room in North West London. Guided by an experienced leader, twenty of us went on a reflective journey and bonded through the sharing of personal stories, breathing exercises and meditative visualisation. It was difficult to adjust each evening after work to this new environment but I was rewarded with an experience that was at times deeply moving. There were also moments that stretched my open-mindedness to it’s limits, such as when one member of the group, a gay Irishman, was invited to share messages from the other side and duly began to ‘channel’ an ancient Chinese warrior. I struggled to absorb his useful tips on negotiating the challenges of life because I was preoccupied by the strange accent he was talking in. I did not know what was more amazing, that he was communicating from beyond the grave, or that a Chinese warrior had learnt to speak English in the afterlife. Sometimes I feel that progress moves too fast. If I had been born during the time of Copernicus I would have been at the front of the angry mob baying for his blood when he announced his blasphemous theory that the Earth revolves around the Sun, and not the other way around. I am not what marketeers call an ‘early adopter’. I enjoy technology and I can see that it brings many benefits but it also scares me. As we play with our smart phones, attack targets with drones and transhumanists discuss the next stages of the human race’s love affair with technology (upload everyone to computers and head off in rockets to explore the universe, anyone? ), I cannot escape the obvious fact that we are still animals. We have evolved over millions of years to interact with our physical environment, to run, breathe and be outdoors. Many millions of us now work in offices where much of our interaction is virtual. Our societies have developed quicker than our bodies and minds and we are suffering as a result. I believe we are struggling to cope with the demands that our complex modern societies make of us. I think there is something in the old cliché about people in developing countries living happier, simpler lives. Assuming someone is not trying to dig a mine under their village or recruit them to the local militia. But that’s another cliché. To maintain my sanity, sometimes I need to shrug off the silly concerns of an urban existence and enjoy a raw elemental experience. It reminds me that I am alive. I find that I am most content when I react to my basic impulses. How fast can I cycle? How far can I swim? Can I run to the top of this mountain without passing out? Spending time outside of my usual metropolitan habitat in a challenging environment is restorative. When I am concerned with finding and cooking food, or sheltering from the elements, things like how many Twitter followers I have matter much less. Of course, I am straight back on the infernal thing when I get home. But I do not have to break a sweat to enjoy being outside. Just to stand on the edge of a mountain, or on the beach, or even in a park, is enough to make me smile. So next time you spot a beaming simpleton gawping at the squirrels, spare a thought; he’s replenishing his soul. You can, of course, but they won’t go away. I began intensively training for the triathlon with a problem in my left shin muscle (excuse the technical terminology), a trapped muscle in my left shoulder and a right knee rendered dodgy by a car accident. I trained through all these injuries. I did not fall apart and after the triathlon in September 2012, I continued to run, swim and cycle regularly. My shoulder would give me pain occasionally but one day, when I could actually hear the grinding of ball in socket somewhere below my clavicle, I knew it would be a good idea to stop swimming and visit the physiotherapist. So, now I am spending time in the gym and following the physiotherapist’s instructions to strengthen my latisimus dorsi. It is a long time since I went regularly to a gym and I now remember what ludicrous places they are. Side by side, in silence but the for the urgent drawing of breath and the hideous racket of the machines, people run and cycle and operate other awful contraptions with great intensity, while rooted to the spot. Large televisions show muscled maniacs working themselves to the brink of death as the electronic beat pouring out of the speaker system encourages me to go “Harder, faster, better, stronger”. It’s a cardiovascular insane asylum where incarceration is voluntary and paid for. Unfortunately, my body is not built like Haruki Murakami, the long distance running novelist who has run most days for thirty years and never been injured, or the 101 year old man who began running marathons aged 89 and will be competing for the last time this Sunday. If I want to continue enjoying sport for many years to come then I have to listen to my body and strengthen the weak bits. So, I dutifully perform one-arm rows, wall-squats, and inverted rescindicator crunches (I made that one up) in a bid to get myself ready for whatever the next challenge might be. When I stood at the doorway to the crematorium and welcomed mourners to my mother’s funeral for the first time in my life I truly felt like a man. Afterwards, at the wake, I spoke for hours with the friends and family who had come to pay their respects. People who I had not seen since I was a small boy were there and eager to catch up. Through my sister and I lay the only remaining access to our dear departed mum, and so we were much in demand. I did not cry that day. Somehow the rigours of hosting, and being so unavoidably on show, held back the wall of sadness that was waiting to crumble on top of me. The next day it hit me. Once we had cleared the empty wine bottles from the empty house I sat down at the kitchen table, surrounded by cards and flowers, and allowed myself to let go. Losing my mother to cancer made me realise how precious, and brief, life is. It was a galvanising experience. It made me think about how many things there are that I want to do while I am still walking around on this spinning ball of dust. That does not mean that there are not days when I feel like hell and do not want to leave the house and would rather alleviate the sadness with the temporary respite afforded by alcohol, or ice cream. There is no escaping the finality of death; my life changed irreversibly when my mother died but what she left me in passing was an insatiable desire to go on and enjoy the world. If you will forgive me for adopting the tone of a bible-wielding evangelist who has turned up on your doorstep at an inconvenient time on a Tuesday evening, it is as if she has been born again through me. Everyday, all over the world, people are doing amazing things. Felix Baumgartner skydived (skydove?) from the edge of space, Stephen Fabes is a medical doctor cycling around the world, Oscar Pistorius overcame his….oh, wait. But you catch my drift. I love hearing about the extraordinary limits that people push themselves to because it inspires me and distracts me from daily life, the huge gas bill or the family crisis. I was very moved by that message. I had previously thought I could only draw inspiration and I did not realise I could engender it in others. So, whatever it is you love doing, keep doing it, because it might just get someone through. If you enjoyed this post please leave a comment and check out I Run Things, Oli’s excellent blog. 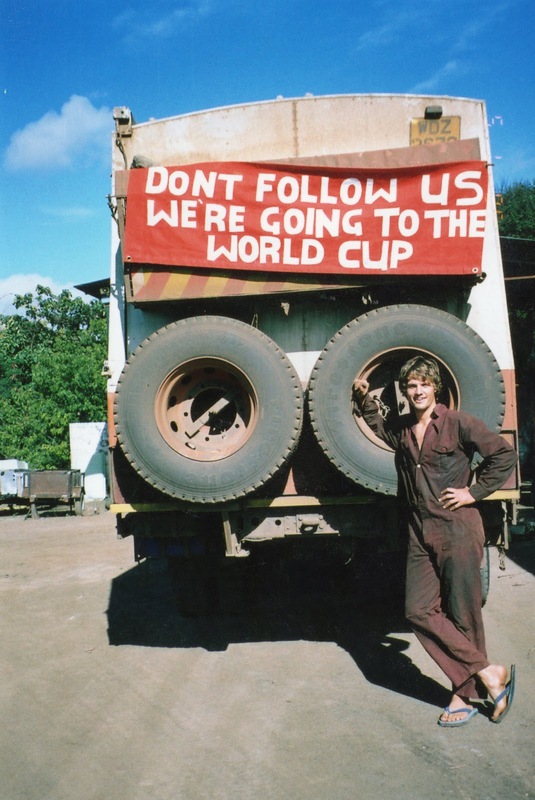 My next post will come from just across the US border and will include an interview with Karl Bushby, a British ex-paratrooper I tracked down in Mexico who has been walking around the world for 15 years. And I might even share some details of that now legendary gastronomic battle with the chicken, you lucky, lucky people. Inspirational thank you. My dad died of lung cancer 11 years ago and it still helps to read this today. Thank you for reading and sorry to hear about your dad. I have also found other people's stories are a comfort. Grief is a lonely place but almost everyone will experience it. In life and in triathlon, it is not so much the challenges that we face (and there will be many), it is how we manage those challenges and keep pushing forward. That's incredible … the write up is mind blowing and shares amazing content….. Thank you !! What a beautiful write up, it was great to hear about your experiences, you seem to have learnt so much, and it's great to hear that you fell in love with the city!